CAIR is happy to provide you with promotional poster that you can put up in your department, clinic or hospital. All you need to do is download the file and bring it to any printing counter (e.g. Staples) to get a great 16X24 poster! 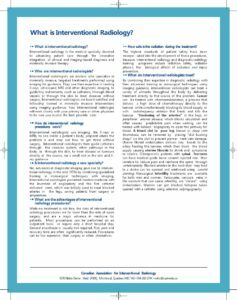 We hope you will take advantage of these to promote interventional radiology in your institution. 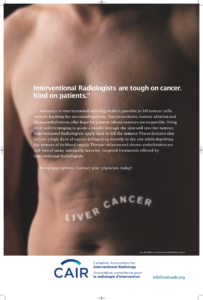 Interventional Radiologists are tough on cancer. Kind on patients. Advances in interventional radiology make it possible to kill tumour cells without harming the surrounding tissue. Two procedures, tumour ablation and chemoembolization, offer hope for patients whose tumours are inoperable. Using their skill in imaging to guide a needle through the skin and into the tumour, Interventional Radiologists apply heat to kill the tumour. These doctors also deliver a high dose of cancer-killing drug directly to the site while depriving the tumour of its blood supply. Tumour ablation and chemo-embolization are just two of many minimally invasive, targeted treatments offered by Interventional Radiologists. Know your options. Contact your physican today! Instead of removing the uterus, Interventional Radiologists are replacing the need for surgery. 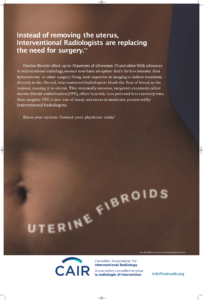 Uterine fibroids afect up to 40 percent of all women 35 and older. With advances in interventional radiology, women now have an option that’s far less invasive than hysterectomy or other surgery. Using their expertise in imaging to deliver treatment directly to the fibroid, Interventional Radiologists block the flow of blood to the tumour, causing it to shrink. This minimally invasive, targeted treatment called uterine fibroid embolization (UFE), offers less risk, less pain and less recovery time than surgery. UFE is just one of many advances in medecine pioneered by Interventional Radiologists. Know your options. Contact your physician today! 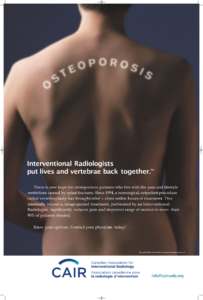 Interventional Radiologists put lives and vertebrae back together. There is a new hope for osteoporosis patients who live with the pain and lifestyle restrictions caused by spinal fractures. Since 1994, a nonsurgical, outpatient procedure called vertebroplasty has grought relief – often within hours of treatment. 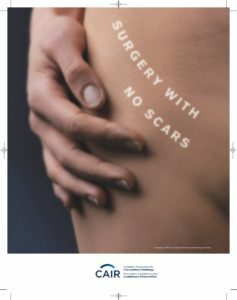 This minimally invasive, image-guided treatment, performed by an interventional Radiologist, significantly reduces pain and improves range of motion in more than 90% of patients treated. 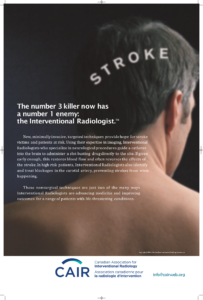 The number 3 killer now has a nimber 1 enemy: the Interventional Radiologist. New, minimally invasive, targeted techniques provide hope for stroke victims and patients at risk. Using their expertise in imaging, Interventional Radiologists who specialize in neurological procedures guide a catherer into the brain to administer a clot-busting drug directly to the site. If given early enough, this restores blood flow and often reverses the effects of the stroke. In high-risk patients, Interventional Radiologists also identify and treat blockages in the carotid artery, preventing strokes from even happening. These nonsurgical techniques are just two of the many ways Interventional Radiologists are advancing medecine and improving outcomes for a range of patients with life-threatening conditions. 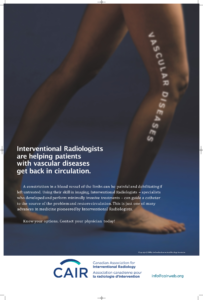 Interventional Radiologists are helping patients with vascular diseases get back in circulation. A constriction in a blood vessel of the limbs can be painful and debilitating if left untreated. Using their skill in imaging, Interventional Radiologists – specialists who developed and perform minimally invasive treatments – can guide a catheter to the source of the problem and restore circulation. This is just one of many advances in medicine pioneered by Interventional Radiologists. 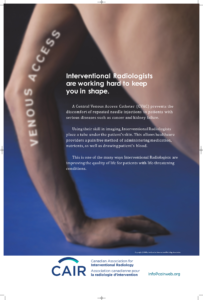 Interventional Radiologists are working hard to keep you in shape. A Central Venous Access Catheter (CVAC) prevents the discomfort of repeated needle injections to patients with serious diseases such as cancer and kidney failure. Using their skill in imaging, Interventional Radiologists place a tube under the patient’s skin. This allows healthcare providers a pain free method of administering medication, nutrients, as well as drawing patient’s blood. This is one of the many ways Interventional Radiologists are improving the quality of life for patients with life-threatening conditions.